Marine zoological studies of worms. 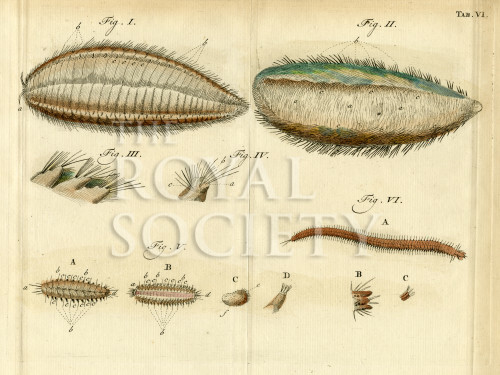 Figures 1-4 Sea mouse Aphrodita aculeate, with details. Figure 5 the scale worm Lepidonotus squamatus (here styled Aphrodita squamatus). Figure 6 the worm Nereis pelagica. Plate 6 from Opuscula subseciva, observations miscellaneas de animalculis et plantis…Tom. II. Liber II, by Job Baster (Haarlem, 1765). The plate is inscribed above ‘TAB.VI’.